Honey Bun’s CEO Michelle Chong – New President of Jamaica Exporters Association | Honey Bun (1982) Ltd.
Michelle Chong, new JEA president (centre) with Marjory Kennedy (left) and Tamra Thomas (JEA Membership and Marketing Manager). 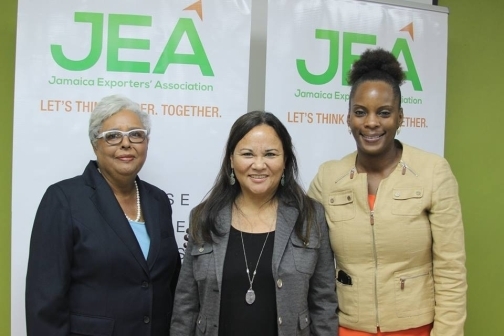 Michelle Chong, co-founder and Chief Executive Officer of Honey-Bun Ltd is the new president of the Jamaica Exporters’ Association (JEA). As president of the JEA, Chong who was selected at yesterday’s annual general meeting where a new board was also named, will have complete oversight over the JEA’s operations and strategic initiatives and will report directly to the board. Honey-Bun Ltd has been in operation for over 32 years and was previously designated a Champion Exporter and continues to be a leader in the Jamaican export sector. Under Chong’s leadership Honey-Bun reported that its profit increased 43 per cent in the April to June quarter. Profit at the company was J$17 million during the period. It helped to bring profit to $64 million over the first nine months of its financial year. Chong also played an instrumental role in leading the initiative to sell Honey-Bun’s rum fruit cakes in the United Kingdom-based ASDA Groceries which supported the tripling of its exports year-to-date. ASDA, owned by Walmart, is the second largest UK supermarket chain by market share and operates in over 550 locations. “For the first two months of this fiscal year (October and November), exports have already increased by over 350 per cent. The Buccaneer Jamaica Rum Fruit Cakes were exported to the UK in November and are available in ASDA this year for the first time and we plan to continue on our increase in exports,” said Chong. Concurrent with Chong’s appointment, Marjory Kennedy, former President of the JEA, will step down after a very successful stint with the company. However, Kennedy will remain on the JEA board.